Hunter Douglas also has a beautiful assortment of modern window treatments that open and close vertically, perfect for these types of windows. Hunter Douglas offers a wide variety of beautiful window treatments, that will suit your needs in any room and for any window type. One of the hardest window types to dress is a wide window expanse or sliding door. While you could dress it with a traditional window treatment that you raise and lower, this could get awkward, especially with a sliding door. Traditional window treatments are also sometimes hard to hang over very wide windows. You may be thinking this means your only option is vertical blinds. Thankfully, Hunter Douglas also has a beautiful assortment of modern window treatments that open and close vertically, perfect for these types of windows. Wait a minute, shutters on the inside? You bet! Shutters are not just for the outside of the house. Hunter Douglas has three shutter collections offering plantation style shutters that can be made as bi-fold or put on a track system. 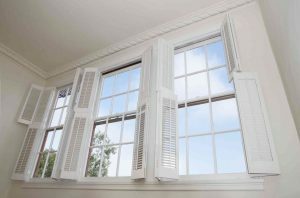 The shutters can be made from a variety of materials, including real wood and Polysatin compounds. They are strong, durable, and beautiful, and they can fit any décor. This is a great option for a door or window that needs a treatment with the benefit of better insulation from hot or cold weather. The cellular construction of the shades is the reason for their improved insulation qualities. They come in a variety of colors, including a “100% darkness” room darkening option, and are available for either horizontal or vertical installation. For your sliding doors or expansive windows, the vertical installation option, using their Vertiglide system, will suit your needs best. Vertical sheers can provide a classic, elegant look to your room. They combine sheer fabric, reminiscent of traditional sheer drapes, with opaque vertical vanes. The vanes allow you to control the light that comes through (and the level of privacy you want), by rotating 180 degrees, but the sheer fabric remains in place. Gliding window panels provide a modern look, combining sleek lines and a variety of materials. The panels stack neatly together when they’re open, then close tightly to provide privacy and show off the fashionable textile choice. You can add as many panels as you need to the track system to cover your window expanse. This is another popular window treatment that comes in a vertical option. These shades come in a variety of natural materials, including wood, reeds, and grasses, and provide a nice, casual look to your room.